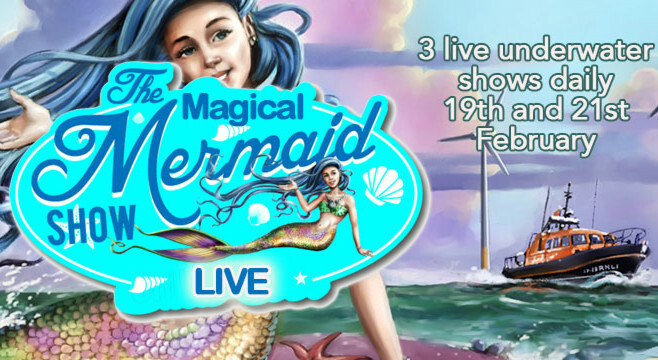 The legend of the Skegness mermaids lives on with the mermaids appearing live this month at Skegness Aquarium. This is a once-in-the-season opportunity to see this spectacular underwater live event, so booking is advised to avoid disappointing the mermaid fans in your life. General Manager Richard Longworth said: “At the Aquarium in Skegness we are located just 150 meters from the sea so it’s only a short hop or a few flips for the Mermaids. He added: “People ask me all the time, “are mermaids real?” and the answer is to come along and see, you will not believe your eyes when they are swimming right in front of you. Included in the Mermaid show entry at Skegness Aquarium are interactive games, sandpits, tank talks, a diver feed, a great bistro, soft play areas, pirate treasure hunt, marine shop. There will be three shows a day on both Tuesday 19th and Thursday 21st of February, with all-day admission is £9 for adults £7 for under 13 years of age. Doors open at 10 am each day. The mermaids will be in the main tank and also on land for photo opportunities during the day.